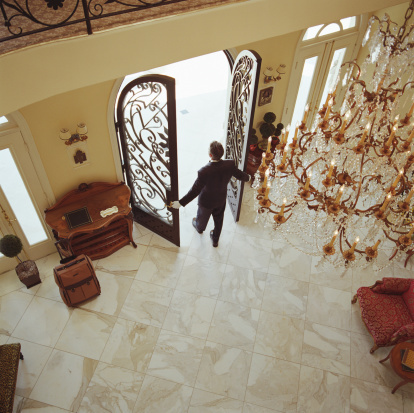 Slate is a type of natural stone, often used for flooring inside your home. The use of slate adds a sturdy surface that will last a long time when cared for properly. Natural stone surfaces, such as slate, are porous and absorb stains quickly. Candle wax spilled on slate indoors causes stains that have a greasy residue and can leave candle wax dye on the slate. Remove candle wax stains from slate surfaces carefully and completely to ensure you maintain the appearance and condition of your slate surface. Mix 1 tsp. ammonia and 1/2 cup water in a bowl. Wet a clean cloth with the diluted ammonia solution and wipe your slate surface to remove any greasy residue left by the candle wax. Apply the poultice paste to the candle wax dye stain on your slate. Spread the paste over the entire stain, applying enough paste so it's about 1 inch thick. Place a piece of plastic wrap on top of the paste, then allow the poultice paste to dry. Discard the plastic wrap and poultice materials. Use your spatula to scrape up the dry poultice material. Wash your slate surface with a natural stone cleaner, then dry with a clean cloth.